NetEnt has been innovating with their online slots for many years (cascading wins, walking wilds and so on). With ‘EggOMatic’ they have taken a quirky and novel idea, and managed to add an entire new dimension to their games. The mechanical chicken theme is certainly entertaining, the idea of having eggs moving from right to left on top of the screen which interact with the wild symbols is pure genius. I have covered the following information in this review of Net Entertainment’s EggOMatic: First the basics of the game, wins, bets and options. After that the EggOMatic feature is covered, including eggs, free spins and expanding wilds. When you strip away all the fancy ideas and amusing mechanical chicken characters, this is a 20 win line video slot with 5 reels. As with most of the recent NetEnt slots, the 20 win-lines part is fixed. Instead you can adjust the level and coin size, which get multiplied to give you the total spin amount. You can go up to level 10 and $1, which gives you a $200 spin, though most people will play in the 20c to $2 range. When the day-to-day wins come in the rule is: The bigger the chickens, the better your prize. The biggest red ones can net you 1000 coins for 5 and the pinkish female one 750. This goes down to the small sad looking ‘worker’ ones which only bring small wins – though these do add up. There is a wild symbol, which is a chicken holding a wild symbol. This interacts with the eggs as described below. Here is why you should check this game out – the EggOMatic machine. This sits to the right of the reels, and randomly produces eggs which appear on a conveyor belt on the top of the reels. These then move one reel to the left each time you spin – eventually falling off of the belt. There are several types of eggs, some appear in normal play, while others only appear during the free spins rounds. Most of the eggs have a money amount on them, measured in coins from 50 to 2500. To win this money, you need to get a wild symbol in the reel below the egg. This causes the wild chicken to stand up, catch the egg, and for the coins to cascade out. You’ll then get whatever wins were generated from the reels on top. 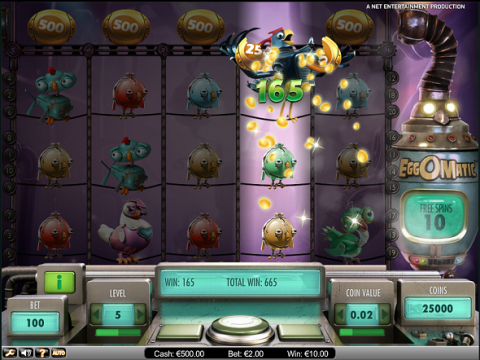 Free spins are also ‘caught’ by the wild chicken. Here you’ll see an old black and white TV with a counter beside it, and play the spins with a different background. The EggOMatic goes into overdrive, filling up with bigger prizes and the different eggs. Free spins can be retriggered, or you can get a mystery egg, which could be money, spins or wilds. The best egg of all is an expanding wilds egg, this grows the wild into 9 (the adjacent and diagonals), producing a lot of wins. I have not seen more than one of these drop – though in theory you could get even more of the reels wild this way. When the spins are over the special eggs disappear, and leaving the money eggs behind for you to carry on the game. There are no break-out features, this slot is crazy enough with a combination of the normal game-play, electric shocked chickens which show you the wins, and the excellent free spins game. NetEnt slots work only in your browser window. This company deliberately skipped the traditional download model, and powers the new generation of casinos which use responsive games that work on both computer and mobile devices. This game is part of the new 'NetEnt touch' range, a smaller selection of the best titles from this leading slots software house, which have been adapted to work great on both Android and iOS devices. This slot is currently in my favorites, list. It is fresh and quirky, and the free spins round in particular can generate some big wins (especially with multiple re-triggers). Some slots of this type get boring fairly fast. While only time will tell, my feeling is that the system with the eggs and dynamics on the reels will keep this game interesting – even without break out features or a progressive jackpot like the one on Mega Fortune. Who knows, maybe Net Entertainment are already planning a sequel which includes them!